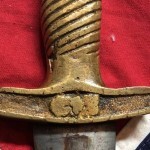 Confederate Artillery Short Sword, C.S. 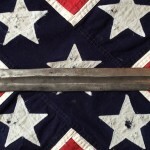 Even though considered scarce this type Short Sword is one of the more common Confederate edged weapons. 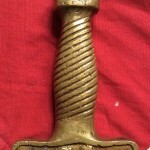 These Short Sword are often reproduced so the buyer needs to beware, however there are many ways of identifying an authentic sword versus a reproduction. 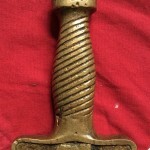 If you look closely at the handle you will clearly see the casting flaws. 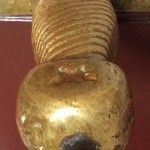 The star at the top of the pommel rarely has the five points you would normally see if it were perfect and even if one side did the other side wouldn’t. 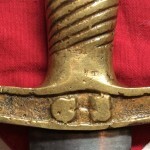 The CS on the guard at the base of the handle are barely readable. 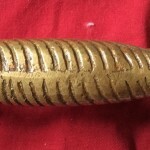 The handle is hollow and many have holes in them, some were even filled with lead. You’ll also see where the mechanics filed the rough edges. 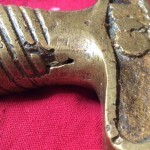 The brass handles have a high copper content that’s often very noticeable. The blades are crude but cleaner in appearance then the handles, but all still have there flaws. 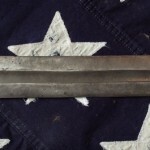 There is a single nonstop fuller that’s about 13” long which is never straight. 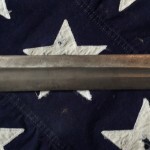 Believed by many to have been manufactured in Selma Alabama or Macon Georgia. So that brings me to the next example in the Civil War Arsenal. 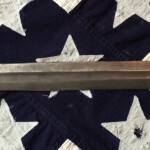 The overall length of this Short Sword is 24 ½” long with a handle of 5 ½” and blade 19”. It weighs 2 ¾ lbs which would make it cumbersome to carry, especially on a long march with all the gear a foot soldier would have to carry.